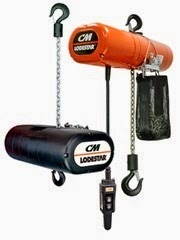 Home / news / The True Meaning of the Name "Lodestar"
The True Meaning of the Name "Lodestar"
Many who are familiar with rigging and hoisting equipment have probably heard the name "LODESTAR" when referring to the popular Columbus McKinnon hoist. The Lodestar is a staple in both entertainment rigging and lifting as well as industrial rigging and lifting, but why is it called the Lodestar and not the LoadStar? “Lodestar” is defined as a guiding star. In 1955, when the first industrial Lodestar was introduced, many of our hoists had galactic names like Meteor, Satellite and Comet. It was the first of many unique products that Columbus McKinnon brought to the material handling industry, which also included aluminum hoist frames, the Weston-Type brake, and the first alloy chain." Read the original article written by Gisela Clark (Social Media Specialist for Columbus McKinnon Corp.) here.